The release’s lengthiest special feature (and most standard aside from the included theatrical trailer) is a 27 minute behind the scenes featurette in which the cast and crew discuss taboos, how it’s an “American film”, and basically just continuously attest to the film’s power and intricacy. In Conversation with Tilda Swinton is an 18 minute Q&A session taped at the 38th Telluride Film Festival in 2011. The conversation is heavy and the moderator overly flattering, but it serves as a quick summation of the always fascinating actress’ career. Things are most interesting when she recollects her time spent with Derek Jarman. The most interesting special feature is four minutes worth of raw footage from the La Tomatina festival, sans sound, which actually adds an unsettling effect of a different kind than is seen in the film. Swinton’s apparent ability to switch in and out of character in an instant is really impressive. And things wrap up with a brief on-the-spot interview with the original source material’s author who recounts an important role that she played in the making of the film. Really though, this isn’t the type of film where you immediately hit the extras after the closing credits, the experience takes hours to sink in. 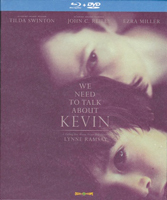 We Need to Talk About Kevin is now available on Blu-ray/DVD.